Find out if the Garment is Branded or not. In this way you can find out if the garment is branded or not.In this fashion fashion, everybody is in the hood of good looks and if you talk about the youth of today, they do everything possible to look good. On the other hand, we have seen that today's younger generation is very brand conscious, due to which they buy only branded clothes. But often it is often that we think of being branded, we bring the cloth home but later it shows that it is not branded, that is, we are cheated in the name of the brand. Fashion Experts agree that if some things are closely monitored while buying cloth, then your chances of being cheated decreased. Generally people identify branded clothing by looking at their tags. But nowadays the fraudsters have become so experts that they put a tag like a branded one. In this case, you can closely identify the tag by looking at it. Many brands tag in the linings of clothing, which is their true identity. Know about the shop before buying clothes. Actually there are many brands, which are not available in every shop, they are found only at a particular shop. Learn about both your brand and shopping location. One way of recognizing branded clothing is to wear it and see it. Actually these clothes are made according to your body. If your size is cloth and does not fit, then this means that there is something elastic. Identify any branded fabric easily by the quality of his clothes. The fabric of any good brand is fresh and soft compared to other fabrics. If a cloth is not branded, its cloth will be slightly rigid and ruffle. 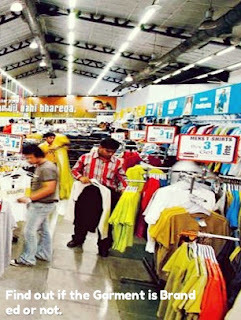 Many times people refer to heavy discounts, instead of branded clothes, they sell other clothes cheaply. But many such brands are not discounted. So if any international brand is selling heavily on the brand, then there is no doubt in it. Branded fabrics are equipped with good quality accessories. When buying cloth, take a look at their accessories too. Check your zip, for example. garment is branded or not.